The weather has been quite nice lately, though I've been too busy with other stuff for much photography. 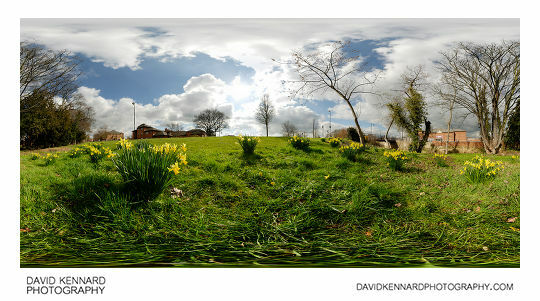 However, I did manage to get out a few days ago to take a couple of panos of the Spring Daffodils in the town. It had been sunny all day, but as soon as I left the house I could see a cloud heading towards the sun. So I walked to where I wanted to take the pano as quickly as I could, to try and get there before the cloud covered the sun. (I had this location in mind for a pano as I had walked past it earlier in the week and thought it looked nice). But just as I got to the location, the cloud covered up the sun. So I set up the tripod, then had to stand around there for quite some time while waiting for a gap in the cloud cover that the sun could shine through. 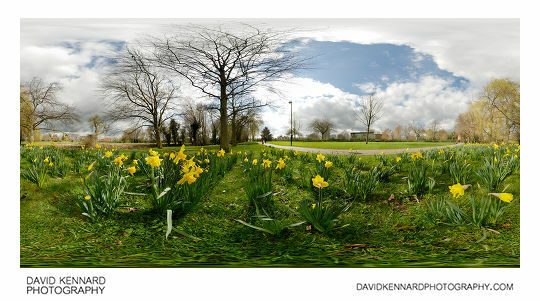 For taking these panos, I used the tripod as low as it can go, to emphasise the daffodils. Stitching the panoramas was quite tricky as both the daffodils and tree branches were blowing about a lot in the wind. So I had to spend quite a while manually setting control points in PTGUI to avoid control points being set on bits that moved between images. And then even after that, it wasn't a perfect stitch. Because everything was blowing about, I also had to do quite a bit of masking in Photoshop to fix problems where objects had moved between images. The yellow daffodils blow out and loose detail quite easily, so I masked in the daffodils (and the sky) from the EV-1 images, while the rest of the images (mostly the grass) are from the EV0 images. I applied a tone curve to the EV-1 image to brighten it to approximately the brightness of the EV0 images, while still keeping details in the highlights. Shooting the panoramas with a batch-stitchable pano head (one where the camera is locked into exactly the same position every time) would have meant that I didn't need to spend time manually assigning control points. And if it had been a windless day, then the whole processing of the panos would have been quite easy. Unfortunately if you wait for better conditions, you may find they only come along after what you wanted to shoot has disappeared, so this isn't really an option. 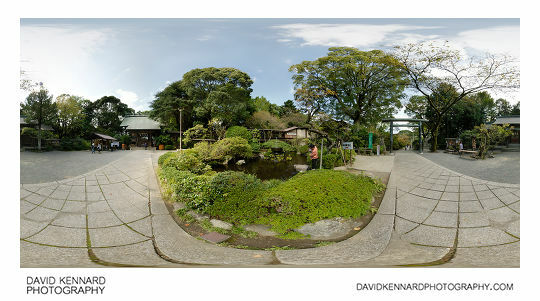 I also processed a couple of older panoramas from Japan lately. This one is from the Hotoku Ninomiya shrine at Odawara castle. I did think that I'd shot a panorama on the castle grounds as well, but I guess I didn't. The grounds of the castle are quite different, with some big cages with monkeys in, like a zoo. The shrine is dedicated to Ninomiya Sontoku, who was a famous Japanese Peasant who rose to a high ranking position by helping reform governement finances and increasing agricultural production. He is used as a model for Japanese school children as apparently he was always studying even when working on the farm. This is the view from the hotel room at the hotel we were staying at in Ōiso. Ōiso is located in Kanagawa prefecture, on the east coast around the centre of Japan. It is a good location for visiting places such as Odawara and Hakone. Unfortunately we tended to go on day trips while we were staying there, and didn't really explore Ōiso itself. As you can see in the image above, there are lots of nice mountains around the area.